After completing basic training, the 27th USCT was attached to the Army of the Potomac, led by Generals George Meade and Ulysses S. Grant. 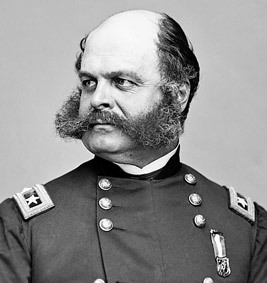 The Army of the Potomac would spend the Spring of 1864 locked in a death grip with the Confederate Army of Northern Virginia, led by General Robert E. Lee. As the two armies slugged it out across northern Virginia, closing in on the Confederate capitol of Richmond, much of the combat developed into grueling trench warfare, ultimately culminating at the city of Petersburg, where Lee’s troops dug in once again. 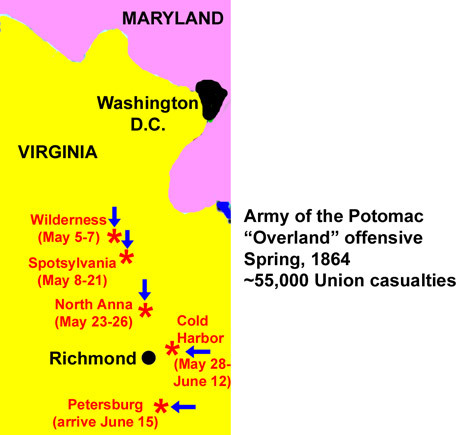 Up to this point virtually all the fighting had been done by white troops. Many Union officers didn’t trust black troops in combat. Others were concerned about Confederate threats to enslave captured black soldiers or execute them for “servile insurrection”. Events at Fort Pillow in Tennessee in April seemed to confirm these threats, with reports of hundreds of black soldiers being executed by Confederates after they surrendered. And so Private Carter and the black troops of the Army of the Potomac were assigned to guarding wagon trains behind the lines. After a brief delay, Ledlie’s men started moving across an open expanse of land called “no man’s land”, towards the Rebel lines that had just been destroyed. Here they found an enormous crater, about 120 by 50 feet, and 25 feet deep. Operating under the orders of General Ledlie (who remained behind the lines at a bombproof shelter throughout the action), the men clambered into the crater. 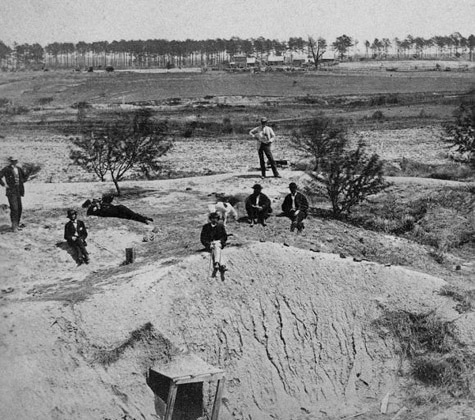 The walls of the crater were very steep, and the men soon learned that getting in was a whole lot easier than getting out – especially when the Confederates recovered enough to begin firing at them. 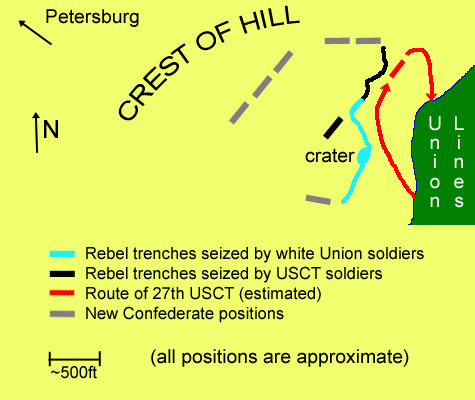 Some of the men began an attempt to break out to the north and south, where the crater adjoined the existing Confederate trenches, but the going was made rough by the upheaved terrain, the confused labyrinth of Confederate entrenchments, and the resistance of those Rebel soldiers who had survived the blast. And none of this was moving towards the true objective, which was the crest of the hill to the west of the crater. Oberlin News; Civil War Military Records (“Carter, Perry” file), O.C.A. O.R., pp. 596-597; Affidavit (Simpson Younger, June 5, 1886), “Carter, Perry” file, O.C.A. 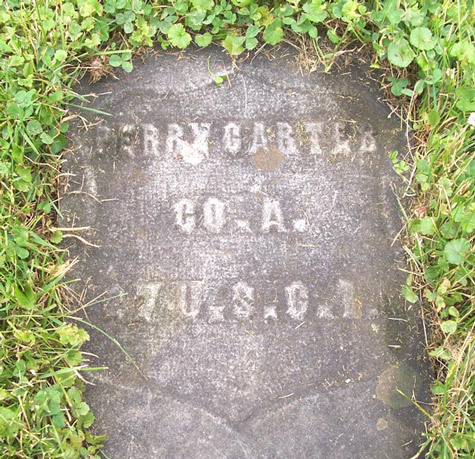 Civil War Military Records (“Carter, Perry” file), O.C.A.